Many a child has been known to wait all year to come back to Gan Israel! Campers ages 5-12 enjoy a wide range of exciting activities and field trips in a warm and vivacious atmosphere. With 3 age divisions; Explorers: Grades K - 1, Trailblazers: Grades 2 - 4 and Pioneers: Grades 5 – 7, children all along the spectrum are ensured a wonderful experience. The four week session is a full program of sports, games, crafts, dramatics, trips and other enriching camp activities. Our experienced staffers work to develop skills, confidence and a sense of fair play within each child. Gan Israel is much more than a physical break from the school routine and winter activities. It’s a comprehensive program designed to strengthen the whole child. 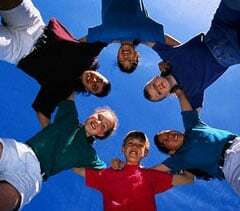 We provide campers with a rich and wholesome summer vacation of fun and excitement along with friendship and meaningful educational experiences. Gan Israel campers are imbued with a deep sense of pride in their Jewish heritage and a love for the land of Israel. Campers make Challah weekly- a true highlight! Our weekly program is enhanced with: drama, fitness, tennis, swimming carnivals, creative crafts, yoga, dress-up days, color war, bunk competition, Challah baking, and .. oh... so much more. Gan Israel’s on the go! Daily field trips are free and include swimming, tennis, drama, and feature excursions to many local attractions.